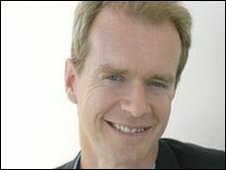 As the new year dawns, five BBC correspondents share their predictions for 2010 with Stephen Sackur, for BBC Radio's Correspondents Look Ahead. 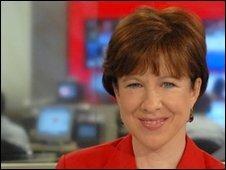 What do defence correspondent Caroline Wyatt, North America editor Mark Mardell, economics editor Stephanie Flanders, diplomatic correspondent James Robbins and world affairs correspondent Lyse Doucet expect to be the big stories of the next 12 months? You can send your thoughts to the programme team by emailing lookahead@bbc.co.uk or adding your comments to the Have Your Say debate. What will be the biggest story in 2010? Political convulsions in Iran, with the possibility of President Mahmoud Ahmedinejad being forced out of office and the Supreme Leader, Ayatollah Khamenei, forced to turn to former President Rafsanjani and other "moderates" to save the revolution. Give us one name to watch in the coming year? 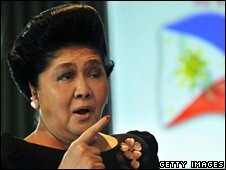 Internationally, the former first lady of the Philippines, Imelda Marcos, who is trying to make one of the most unlikely comebacks in the country's political history. Where will be the place to be in 2010? The finishing line of the London Marathon on April 25. I am determined to get there even if I have to crawl on hands and knees. Who would you most like to interview next year? Fabio Capello after the World Cup final, to get the inside story on England's amazing triumph over Brazil. Or Sarah Palin on the next phase of her campaign to persuade America to join her in "going rogue". The biggest focus in defence will be on whether the strategy agreed by the US and its Nato allies in Afghanistan works. The main challenges will be accelerating the training and mentoring of the Afghan National Army and police, and helping the Afghan government to try to ensure that its people have the security they long for. Back at home, all eyes will be on the strategic defence review, and how a new government sees the role of Britain and its Armed Forces on the global stage - and how much of that role the country can afford. 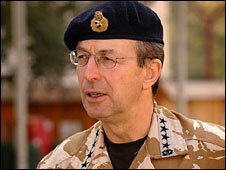 General Sir David Richards, who replaced General Sir Richard Dannatt as Chief of the General Staff in August 2009, becoming the professional head of the British Army at one of its most testing times in decades. He has come out fighting for the campaign in Afghanistan, seeking to explain it to an increasingly sceptical public, and helping to put the MOD on a war footing. In 2010, he and all the Chiefs will have to fight hard to ensure the right resources for defence at a time of increasing financial strain. For a defence correspondent, anywhere in Helmand - to see how the strategy is working out on the ground with British, US, Danish and Estonian forces. I would also like to find out whether Afghans really believe their lives can improve, or whether they're still hedging their bets in case the Taliban outlasts Western forces and the Afghan government. 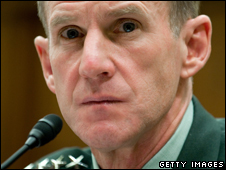 General Stanley McChrystal, the overall Nato commander in Afghanistan. He warned in October 2009 that the situation in Afghanistan was serious, that time was running out, and that the campaign had been under-resourced and under-coordinated in the past. He said that protecting the Afghan people was key. Will he - and most crucially, they - feel that has been achieved, one year on? I suspect we are long overdue a "black swan" - an unpredicted, unexpected game-changer that flutters out of nowhere. More predictably, my umbrella story for 2010 will be how President Barack Obama lives up to, or disappoints, hopes and expectations. Oh, and how he copes with that "black swan". He is a 38-year-old conservative Republican whose working-class parents came from Cuba, and who is challenging Charlie Crist, the sitting (moderate) Republican Governor in Florida, for the vacant Senate seat. 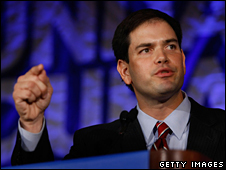 Rubio has already held three leadership positions in the Florida house. But the contest also stands as a fight for the soul of the Republican party. Many conservatives are urging a return to core values, from anti-abortion to low taxation. How these contests turn out will affect who gets the Republican nomination in 2012 - Sarah Palin is still a heroine to the right. If I were a Republican strategist, I would be looking for figures conservative enough to thrill the base without being shrill or bullying - a Reagan not a Nixon. I am always pushing to cover Obama's holidays in Hawaii, but can't convince any of my bosses that it would be very productive. So I will say Colorado. It is the one state that keeps coming up on people's hit-list for all three of the political contests in November: Governor, Senate and House. It narrowly went for Obama in the Presidential elections, and although its name means "red", it is a "purple" state, a mixture of red and blue, Democrat and Republican. I hope to track down some of those elusive swing voters, and find out what they think of the key issues and how their President is handling them. Mr Obama, obviously. And I would love to know what George W makes of it all. But, after a lifetime of interviewing politicians, what I enjoy most talking to a huge variety of people from every stratum of society about their hopes, fears and passions. The global economy coming out of recession. I will be looking to see the strength of the recovery, particularly in countries such as the US and the UK, which could face a weaker than usual bounce-back after recession, or even a double-dip. Another big piece of the puzzle will be the relative balance of growth between developed and developing countries. China and others are growing at much faster rates than the mature Western economies, accelerating the eastward move in the global balance of economic power. Zhou Xiaochuan - Governor of the People's Bank of China. 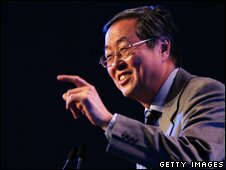 Mr Zhou has emerged as a pivotal figure in global economic policymaking over the past year. He has spoken about replacing the dollar as the world's reserve currency. Given China's enormous foreign reserves, China can influence the role of the dollar directly. Mr Zhou's management of China's domestic boom will also be much more important than usual to the shape of overall global demand. South Africa for the 2010 football World Cup. Where else? 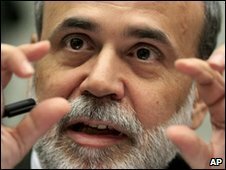 If not Zhou Xiaochuan, then Ben Bernanke, head of the US Central Bank, who has a very tough year ahead. The world's most important central bank needs to take the economy off life support fast enough to stem fears of inflation down the road, but not so fast that it kills the economic recovery. Few expect him to hit the balance exactly right. Internationally, I predict the collapse of the 2010 Review of the Nuclear Non-Proliferation Treaty but nonetheless expect there to be real nuclear disarmament by the United States and Russia. Also, stand by for economic meltdown in one of the weakest European Union countries - Greece, Ireland, Spain or Italy. Could an EU member state follow Iceland down the slippery slope? In the UK, we will all be watching New Labour on the ropes 13 years after the first Blair landslide. Can Gordon Brown bounce back? Is David Cameron on course to put the Conservatives back in 10 Downing Street? Or is Britain really headed for a hung parliament and possibly a coalition government? Yukiya Amano, the new head of the International Atomic Energy Authority. He has just taken over from Mohammed El-Baradei in a very hot seat indeed. South Africa for the World Cup. Much more than simply the biggest sports event of 2010 - a celebration of an extraordinary country too. Stephen Fry. More than just "quite interesting", whatever he talks about. Iran's Supreme Leader, Ayatollah Khamenei (dream on!). Barack Obama (ditto). Can he turn the rhetoric into results? And Aung San Suu Kyi. Does the Nobel Peace laureate and prisoner still have any hope of change in Burma? 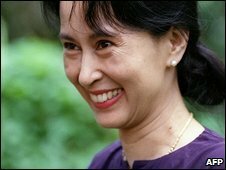 Will tightly controlled and restricted elections in Burma in 2010 - from which she is excluded - make any real difference? Or are they just a sham to prolong the regime of the ruling generals? The success or failure of the Afghanistan/Pakistan, or "Af-Pak", strategy. 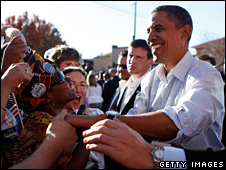 There is so much at stake: the success or failure of President Obama's most important decision - such as sending in more troops - and stability in Afghanistan and Pakistan, with ripples across the region, and indeed the world. This is also the testing ground for Nato. 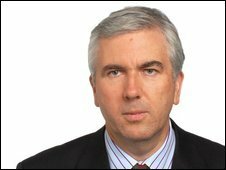 Key decisions will be made in the most important Nato capitals this year on troops and commitments. Israeli Prime Minister Benjamin Netanyahu. How his thinking evolves (or does not) on the Israeli-Palestinian peace process, peace with Syria, and what to do about Iran, will be crucial to the fate of these key issues - all of which can be explosive. Kabul, the nerve centre for many of the key players in the Af-Pak strategy. 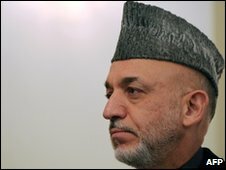 Will President Hamid Karzai get his act together? Will General Stanley McChrystal be able to fashion a winnable strategy with his 40,000 extra troops? And can the world's top military leaders and diplomats really turn the tide against the Taliban? Iranian President Mahmoud Amedinejad as I really want to know what he is thinking. 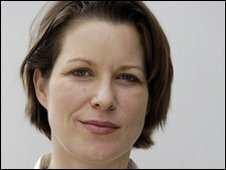 Correspondents Look Ahead is on BBC Radio 4 on Friday, 1 January 2010 at 2000 GMT and on the BBC World Service on Saturday, 2 January at 1805 GMT. Or listen again via the BBC iPlayer. 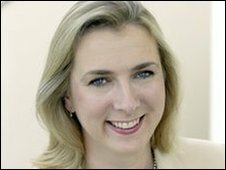 And you can share your predictions about the year ahead in Listeners Look Ahead on BBC Radio 4 on Saturday, 2 January at at 1400 GMT. Or listen again via the BBC iPlayer.